According to Mintel beauty research, water is the new luxury. An upcoming trend ready to hit the beauty and skin care industry is “water as a precious commodity.” With environmental awareness on the rise, 45 % of millennials are likely to refuse to purchase a product if that company is not involved in environmental issues. Earth’s natural resources are becoming depleted, and it is not going unnoticed. SkinCatering® Spa & Skin Care has been ‘water conscious’ since the very beginning. We use freeze-dried ingredients and super-foods in our skincare and services to limit the amount of water and preservatives needed. This method allows us more control of water usage during the re-hydration process. Often times we use other liquids to re-hydrate in place of water such as aloe or yogurt- both of which are extremely healthy for your skin! Clients receive the same benefits from these freeze dried ingredients as they would using the fresh ingredient or fruit. SkinCatering® Spa also incorporates an infrared sauna blanket as well as towels for our wraps and body treatments. The benefit of this is we don’t have to rely on a shower where water could be wasted. Conserving our use of natures most valuable resource, the spa also uses a dry, infrared sauna. This dry infrared sauna does not use water or steam, instead it uses the heat from infrared spectrum lights heating you from your core. Eco-friendly, cruelty free, gluten free and vegan certified; SkinCatering® cares about the Earth just as much as we do our clients. Kim is SkinCatering®’s resident expert when it comes to skin. A licensed Aesthetician since 2002, she was at one time an Aesthetics Educator for a world renowned skin care company. 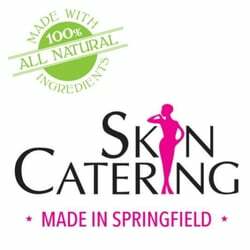 After traveling all of the North Eastern United States as a leader in the industry, she finally found her home with SkinCatering®. Everyone draws inspiration from somewhere, I asked Kim what inspired her to choose the Aesthetician/Skin Care field. What is her favorite part of what she does as an Aesthetician? For every career there is a highlight. For Kim, her highlight is really inspirational. Maybe you didn’t know but Kim hasn’t always been a part of the SkinCatering® Team. I asked her what made her decide to ‘hop on board’ so to speak. Not only did Kim ‘hop on board’ this amazing train that is SkinCatering®, she is a partner! I asked her how she would describe her role as partner at SkinCatering®. With all the fun Leanne & Kim have together at SkinCatering®, I wanted to know what she enjoys the most. And finally, every business grows and expands and so does every individual in his or her career. What are Kim’s hopes or aspirations for the future of SkinCatering®?